The afternoon at the Community Vilaj began with a presentation by UNESCO's Small Island Voices Project. 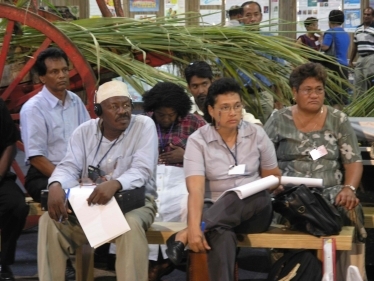 UNESCO's Small Island Voices project began in 2002 with the aim to linking islanders from the Caribbean, Indian Ocean and Pacific regions to advance sustainable island development. The first of the Small Island Voices presentations at the Community Vilaj was entitled "Island Memories - Cook Islands", developed by Melinda Pierre and Nancy Kareroa of the Taporoporoaanga Ipukarea Society. Developing global Internet forums that connect 20,000 people in small islands across the world. Attracting youth interest, by involving 38 schools on 13 islands across 3 regions. Preparing and implementing on the ground activities, ranging from promotion of eco-friendly practices and community awareness activities to video training workshops. Promoting conservation of the environment. Discovering and preserving different traditions of the Cook Islands, each with their specific and unique characteristics. Celebrations with a lot of dancing and a lot of food. Including young people in the preparation of celebrations to keep these traditions known by the youth and coming generations. There must be more involvement of the community in setting up environmental projects. Is there a possibility for exchange of documentation on these types of project among SIDS. There is a need for documentation of best practices, to be supported, perhaps, by UNESCO and the Ministry of Culture. Concern was voiced about the absence of participation by Youth and Women's organizations from the Pacific in this SIDS conference. The group noted the how much knowledge, such as that outlined in this presentation, was being disseminated at the Community Vilaj. But, how can we the learning here is effectively channeled to the SIDS conference discussions. Following the UNESCO Small Island Voices discussions, the UN Resident Coordinator and UNDP Resident Representative for Mauritius, Ms. Aase Smedler, spoke with Vilaj participants about their experiences so far. Ms. Smedler noted that the Community Vilaj has a special place in her heart as it is at the level of the people that most likes to work. The Resident Coordinator reiterated her support for community issues and highlighted the fact that it was important to ensure that governments implement policies that are in the interest of the civil society and local people. Further, said Smedler, sustainable development is not only about the environment! Rather it also includes social and economic issues and human rights and cultural concerns as well. In her conclusion, she asked the Vilaj participants to keep in mind that the MDGs are not only academic issues. Communities are essential to giving the MDGs a pulse, a heartbeat and a human face. The close of the day was marked by words from a community participant from Somoa who offered the thanks of the group to Ms. Smedler and the UNDP team for facilitating the Community Vilaj experience. During the morning session, Vilaj participants drove to Swami Vivekanada Convention Centre in Les Pailles to register for the Official Conference and its side events. The participants were then met by Diane Quarless of UN DESA for an informational overview of the conference agenda and protocol and were given a tour of the main area. In the afternoon session Melinda Pierre and Nancy Kareroa of the Taporoporoaanga Ipukarea Society, presented to the Community Vilaj the ‘UNESCO's Small Island Voice Project: Island Memories - Cooks Islands.' 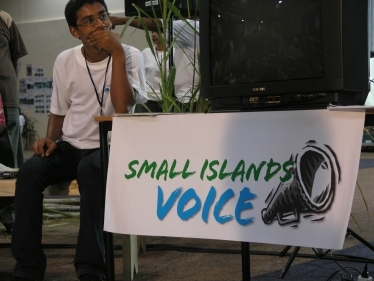 Small Island Voice started in 2002 with the aim to link up islanders from the Caribbean, Indian Ocean and Pacific regions to advance sustainable island development. Participants were then told about the opening of the Conference at Les Pailles on Monday morning. Due to the limited number of places to 250, participants were advised to attend the Major Groups Room at 9:00 to be able to attend the Conference. The Major Groups were allowed to participate on the 5 Panel Discussions to happen over the next few days. The Villaj participation, however, is still to be determined - the participants agreed there was no need to abandon the Community Vilaj, though seats were available at Pailles. Work at the level of the people: human development : what she likes most. To reach human development we need to work also on policy issues. Community: Important process to ensure that govt implement policies that are in the interest of the civil society. Sustainable development: not only the environment! But also social, economic, human rights & culture. Conserve, protect and promote the environment to achieve sustainable development. MDGs - not only academic issues. Final result: combat poverty and hunger situation. How do we capture the creativity and intelligence of women in policy decision- making process? Community can influence structure and democracy in the long term. A New International Order: The Eight (8) MDGs : needs community involvement. Financing for development not only funding by donors but also empowering community in effective sustainable development process. Peace is necessary for development and development reduces conflicts and frustration. UN based on: Peace, Development & Human Rights. Definition of the main aims of the UN. Regarding the situation of indigenous people around the world, emphasis should be put on culture, more to be seen as a gift than a dividing factor. In Latin America, for example, an indigenous woman was appointed foreign minister - an optimistic circumstance for improvement of the situation of indigenous people in the world. On behalf of the Samoa Civil Society & Community, a participant from Samoa extended thanks to UNDP for having facilitated their participation to the conference. The day closed with a decision to leave the CSF closing ceremony which would allow for some time to re-organize the space for the HIV AIDS events.